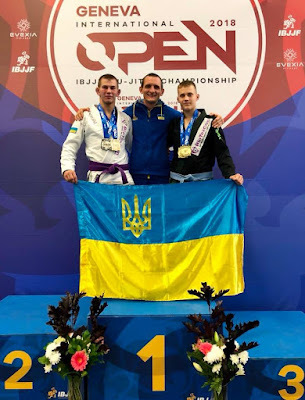 Ukrainian sportsmen from SC “Borets”/ ZR Team performed at the “Geneva International Open IBJJF Jiu-Jitsu Championship”. The competition took place at one of the sport complexes in Geneva, Switzerland. Ukrainian fighters managed to win 3 gold and 1 silver medals. Both sportsmen showed excellent skills and successfully performed in their weight categories. Thus, Serhii Krasovskyi won gold in absolute category among juniors. In turn, Yaroslav Blazhko won three matches and lost one in the final to the opponents who were 40kg heavier. According to the head coach of the SC “Borets”/ ZR Team club Ievgen Skyda, he is pleased with the performance of his fighters. And also on behalf of the whole team is very thankful to the BioTexCom Company for the financial support and opportunity to take part in the championships of such high level.